Beautifully appointed executive family home situated in the private and exclusive Stewart’s Mill neighbourhood of Georgetown! This approx. 4,500 sq ft of total living space will please the most discerning of buyers! The perfect home for raising a family, entertaining guests and enjoying all the upscale amenities that the neighbourhood offers! This home boasts many features that the entire family will enjoy, from the open concept kitchen and family room, to the fully and fabulously finished lower level that looks just like a movie theatre showcase! Lots of sunshine brightens up the breakfast area of the kitchen, with its French door leading to the fully fenced rear yard with patio, hot tub with custom built pergola and lots of room to play! Four generous bedrooms on the second level provide lots of room for the growing family. 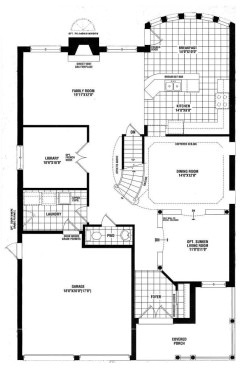 Oversized master bedroom suite has large walk-in closet and spa like ensuite bathroom! Two of the other bedrooms share a bathroom with ensuite privileges and the fourth bedroom has its own four piece bathroom right next door. The main level boasts gleaming oak hardwood flooring and a seamless floor plan with great flow from the formal living room and generous dining room, to the private main level office/den. No detail is overlooked in this pristine and well maintained family home!